There are many variations of this dish. This is my spin on it. I love Greek food. Every time I go to my local diner this is what I order. Forget the eggs and bacon, I want this! 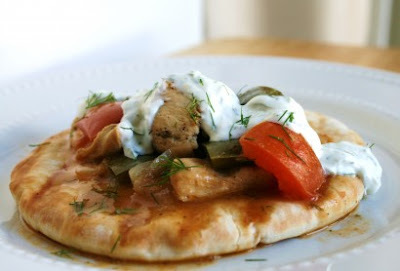 Chicken, peppers, onions and tomatoes all sauteed together and spooned over pita bread. Then topped with Tzatziki yum!!!!! Mix the grated cucumber, yogurt, sour cream, dill, and salt in a bowl. Grate the garlic and mix well. Cover and set in refrigerator until needed. Heat olive oil over medium heat in a large skillet. Add peppers, garlic, and onion saute for 10 minutes. Remove with a slotted spoon and set aside. Add chicken and brown pieces on all sides. Deglaze pan with wine or chicken stock and reduce heat to low. Add tomatoes, oreagno, lemon zest and juice, salt and pepper. Continue to cook for another 10 minutes. Brush each side of the pita breads lightly with olive oil and lightly grill/toast on each side. Spoon a heaping spoonfull of the chicken mixture with pan juices over each pita. Then add a dollop of tzatziki on top. Serve with a fork and knife. I really enjoy your blog and,,,, I've just awarded you with something special on my recipe blog at http://www.recipesfordivineliving.blogspot.com. Stop by and check it out!